Umbilical cord & uterine problems, such as a nuchal cord, vasa previa & uterine rupture, can cause a baby to have hypoxic ischemic encephalopathy & brain damage. A new mother named Niki was told by her doctors that she had a healthy pregnancy. When she went into labor with her son, she was shocked when her doctor ordered an emergency C-section and she realized she had been severely bleeding. Niki had a condition called vasa previa, which caused blood vessels in her baby’s umbilical cord to rupture during labor, leaving the little boy starved of oxygen. Soon after birth, the newborn was diagnosed with hypoxic ischemic encephalopathy (HIE) and severe brain damage. Niki went to the hospital twice during her pregnancy because she was bleeding and each time, she was sent home. After hearing her son’s devastating diagnosis, Niki was heartbroken to learn that her baby’s traumatic birth injury could have been prevented with an extra few minutes of testing when she was in the hospital or at her doctor’s office. Unfortunately, Niki’s vasa previa went undiagnosed and her little boy suffered permanent brain injury. If your baby has HIE, developmental delays, a seizure disorder, cerebral palsy or any other birth injury, email or call the award winning attorneys at Reiter & Walsh ABC Law Centers. Unlike other firms, the attorneys at Reiter & Walsh focus solely on birth injury cases and have been helping children throughout the nation for almost 3 decades. 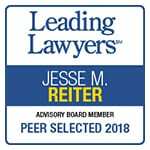 The partners of the firm, Jesse Reiter and Rebecca Walsh, were recently recognized as being two of the best medical malpractice lawyers in America by U.S. News and World Report 2015, which also recognized Reiter & Walsh ABC Law Centers as one of the best law firms in the nation. In fact, U.S. News and World Report has given Mr. Reiter the honor of being one of the “Best Lawyers in America” every year since 2008. Vasa previa is a condition in which the baby has blood vessels that are exposed (not supported by the umbilical cord or placental tissue) and lying in front of the opening to the birth canal (the external os). These vessels, which cross or run in close proximity to the external os, are at risk of rupturing when the membranes rupture during labor and delivery. Vasa previa carries a high risk of death or severe brain damage in the baby. As such, the condition must be timely diagnosed so a scheduled C-section delivery can take place. If the condition remains undiagnosed, vessel rupture and major bleeding can cause the baby to experience severe birth asphyxia, hypoxic ischemic encephalopathy, permanent brain damage and conditions such as seizures and cerebral palsy. HOW DO VASA PREVIA & UMBILICAL CORD, UTERUS & PLACENTA PROBLEMS CAUSE HIE & BRAIN DAMAGE IN BABIES? An unborn baby receives all her oxygen from oxygen-rich blood delivered to her from the mother through vessels that run through the uterus and placenta (uteroplacental circulation) and then the umbilical cord. Anything that affects the blood traveling from the mother to the baby can cause the baby to experience a lack of oxygen to her brain, called birth asphyxia. Problems with the placenta, uterus and umbilical cord, such as a placental abruption, ruptured uterus and compressed umbilical cord, are common cause of birth asphyxia. One of the most common causes of birth asphyxia is when the baby’s umbilical cord is wrapped around her neck, which is called a nuchal cord. HOW CAN VASA PREVIA & CORD, UTERUS & PLACENTA PROBLEMS BE PREVENTED? Low-lying placenta or placenta previa, even if it corrects itself. The health of a baby experiencing vasa previa depends on prenatal diagnosis. Vasa previa can be seen on the ultrasound examinations that are part of prenatal care. It is the standard of care for physicians to check to make sure there are no significant problems with major vessels involved in uteroplacental circulation and in the umbilical cord. Vasa previa can be detected during pregnancy as early as the 16th week with the use of transvaginal ultrasound in combination with color Doppler. When vasa previa is detected, plans must be made to deliver the baby by a scheduled C-section in advance of the membranes rupturing. Second trimester vasa previa may resolve over time. More commonly, however, the vasa previa persists and the vessels are at risk of rupturing during spontaneous or artificial rupture of the membranes. Sometimes, fetal bleeding occurs without the rupture. Once bleeding of the vessels occurs, it can rapidly result in anemia and a severe drop in the baby’s blood pressure due to loss of blood volume. This causes significant heart rate abnormalities called non-reassuring heart tracings on the fetal heart monitor. Vasa previa should be suspected when vaginal bleeding occurs upon rupture of the membranes. When this takes place, preparations for an emergency C-section delivery must begin, and once non-reassuring heart tracings occur, the baby must be delivered in a matter of minutes to prevent severe birth asphyxia, brain damage, hypoxic ischemic encephalopathy and cerebral palsy. The type of non-reassuring heart tracings a baby will experience when vessels rupture are often sinusoidal patterns or a slow heart rate that can get severely slow. Indeed, prompt action must be taken with any condition that affects the circulation between the unborn baby and mother. Listed below are some of the more common conditions that can cause birth asphyxia and birth injuries such as HIE, brain damage, cerebral palsy and seizures. When the baby’s cord is wrapped around her neck, it can cause her to experience a severe lack of oxygen to her brain, especially if the cord is tight around the neck, is wrapped around the neck more than once, or where low amniotic fluid causes cord compression. Other potential umbilical cord complications from a nuchal cord include umbilical cord prolapse (when the umbilical cord slips ahead of the baby in the birth canal) and vasa previa. In these circumstances, the baby may experience fetal distress due to decreased oxygen and blood flow. Fetal distress caused by a nuchal cord is often marked by non-reassuring heart tracings, such as accelerations or decelerations. When a nuchal cord is present, every effort should be made to prevent cord compression. Physicians may try to deliver the baby vaginally, using different techniques to remove pressure on the umbilical cord. However, research shows that handling and stretching the cord can cause reduced blood flow to the baby. Therefore, a C-section delivery is the safest way to deliver a baby who has a nuchal cord and a non-reassuring heart tracing. As with any delivery, if the baby shows any signs of distress, an emergency C-section should be performed immediately, in most cases. A prolapsed umbilical cord is considered an obstetrical emergency because the cord can become compressed between the baby’s body and the uterus, cervix, or pelvis during delivery. If this occurs, the oxygen-rich blood being delivered to the baby can be severely reduced or completely cut off. Umbilical cord prolapse requires prompt delivery of the baby, usually be emergency C-section delivery. A ruptured uterus means there is a complete tear through all layers of the uterus. A rupture is a life threatening condition for both the mother and baby. It typically occurs when the forces of uterine contractions associated with attempted vaginal delivery cause the uterus to tear open, potentially expelling the unborn baby into the mother’s abdomen. If the uterine tear causes the placenta to be torn away from the womb, the baby will be totally cut off from her oxygen supply. In fact if the tear affects the uteroplacental circulation at all, the baby will be at least slightly deprived of oxygen. A rupture can cause so much blood loss that it affects the amount of blood going to the baby, which can also deprive her of oxygen. This lack of oxygen to the baby’s brain can cause birth asphyxia, hypoxic ischemic encephalopathy (HIE), brain damage, seizures and cerebral palsy. When a ruptured uterus occurs, the baby must be delivered immediately by emergency C-section. A placental abruption is a condition in which the placenta tears away from the uterus (womb). If the placenta completely tears away from the womb, no oxygen-rich blood can be transferred from the mother to the baby and the baby will be completely deprived of oxygen. If the tear is mild, the baby may only be receiving slightly less oxygen-rich blood. A mild placental abruption can turn severe very quickly, however, and if the baby is at or near term, immediate delivery should take place. Moderate to severe abruptions always require a prompt C-section delivery to prevent birth asphyxia, brain damage, HIE, seizures and cerebral palsy. We lost Natalie at 21 weeks also. The band was around her hands and cord, she was griippng the cord and the band had fused her hands together around it. In someways i want more answers, in others there is some release knowing there was nothing we could do. Iam sorry for your loss. Thank you for your comment, Joh. We are very sorry for your loss.